Aikido classes look physically demanding and they can be. But the pace of practice can be varied to suit any participant. Students must work with their capabilities and within their own current limitations but no one should be complacent. Each of us should be attempting to improve ourselves and work hard to increase our capabilities during each class and throughout our lives. No one should expect to do it all in one day. Aikido is a wonderful activity that can be enjoyed all life long. Remember the tortoise traveled the same road as the hare. Enjoy the journey no matter what pace you are working at. There is a huge difference between injury and pain. Pain is a signal to you brain that there is some action happening to a part of the body that needs some immediate attention and response. Aikido is designed to allow a person to manipulate an attacker in a manner that does not have to inflict injury in order to stop an attacker. Some moves we use may be painful to the attacker but those moves should not damage that attacker. 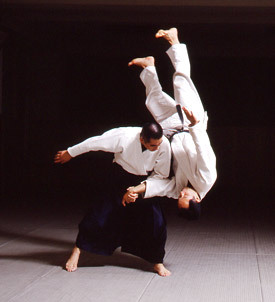 Some aikido techniques will involve joint locks. Most all of those joint locks are done in a way that the joint naturally bends. Because of that, joint locks should not inflict damage. Most commonly, new students are intimidated by ukemi (rolling). Don’t be. It is just a physical action that works muscles in a way that you may be uncommon for you initially. The physical activity required to lift a spoonful of soup without spilling a drop requires more precision and coordination than it does to do a forward roll. Do not let yourself be psyched out! Too many students leave the dojo before realizing significant benefits from their work. Some leave because the classes are difficult. Some leave because life events get in the way. Aikido can be a life long learning opportunity. Stick with your practice. Don’t give up. Many of my students have heard me tell of my experience with a gentleman named Myer Coburn. Mr Coburn started practicing Aikido when he turned 50 years old or so. I met him when he was in his 70’s and worked out with him for many years. When he was more than 90 years old, Mr. Coburn would come into the dojo and throw me around without effort. I consider my practice sessions with Mr Coburn as one of the major highlights in my Aikido experiences. My memory of Mr Coburn inspires me to keep going.